The digital electronic organ has improved tremendously in recent decades and continues to improve; the waveforms of the sound produced by digital organs are made to look exactly like those of real organ pipes. This has fueled an intense debate that has raged on for many years about the virtues of the pipe organ versus the accessibility of a digital electronic organ. The answer to the crux of the argument lies simply in the physics of natural sound and its full array of harmonic frequencies as opposed to listening to the world as filtered through speakers and processors, no matter how advanced; in the end, the harmonics are compressed, and it becomes the difference between virtual reality and reality. The builders of digital electronic organs will concede that there are perhaps irreducible differences in the aural and even physical sensation of a pipe organ's sound compared with a digital electronic instrument; the way the air pressure presses on the human body is also a very different experience between the two. Any musical sound that we hear is a collection of many separate vibrations; the lowest in the series is called the fundamental and determines the pitch heard by the ear; the remainder are termed harmonic upper partial tones, or "partials" for short, and these determine the timbre or tone quality of the sound. Some sounds such as an orchestral flute or organ pipe producing a flute sound contain just a few partials; other more complex sounds such as a violin string or a Trumpet organ pipe contain a very large number of partials. The differences in the number and relative strengths of the partials between two sounds of the same pitch is what allows the ear to distinguish whether the organ pipe producing the sound is a Flute or a Trumpet. The partials of a given sound are related to each other mathematically. In a digital electronic organ, this scientific and mathematical data of real pipe sounds can be carefully duplicated, but the difference is recognized when the sounds are "sent out" of the instrument; here the pipe organ has the profound advantage. When several musical notes are produced by several organ pipes, every partial of every note creates its own sound waves in the air; each individual wave does it's own thing as far as being reflected from the walls and ceiling, and becoming absorbed by carpeting, curtains, or cushions; each wave takes its own amount of time to reach the ears of the listener. The human brain is extraordinarily capable of detecting these difference in wave arrival times, and consequently the brain receives the message that the sound is "complex"; the brain even detects the difference in wave arrival time between one ear and the other, and this desirable effect is drastically compounded when a large number of pipes are played, as when many stops are on and large chords are held. In contrast, digital electronic organs contain speakers that send the sounds to the listener; each speaker sends only a single sound wave, and that wave is the electrically combined total of ALL of the partials of ALL of the notes played; the complexity of the wave reflections and the resulting fullness and beauty are therefore reduced. The sound from speakers is always significantly "directional"; in a pipe organ however the sound of each pipe emanates in all directions, and this room-filling sound of many scores of pipes speaking all at once provides a tonal advantage over a smaller number of speakers and is based on scientific and mathematical principles. These differences in sound quality become more noticeable when the instrument accompanies singing or when other instruments play in addition to the organ; when only one or a few vocalists sing and only a few stops are used on the digital organ, the sound quality of the digital organ is good; but when the same organ is used to accompany a large number of singers, it's sound becomes degraded because in the midst of so many partials and so many waves from the voices of the vocalists and other instruments, the relatively simple wave that comes from the speakers of the digital organ (as contrasted to the very many and complex waves sent out by a pipe organ) loses some of its distinction; the result is interpreted by the ear as a reduction of identity and clarity. We can all get on board therefore with the statement that there has been weakness in the digital side of organ building, but this weakness stems from trying to imitate the complex reality that is the pipe organ. Digital electronic organs are however the de facto home practice instrument; they certainly take up less space, and their initial expenditures are certainly more cost-effective, than with even a very small pipe organ; buyers however must also take into consideration the possibility of needing to replace an all-digital instrument in a generation due to advancing technology which does not compare favorably against the regular maintenance costs of a new pipe organ. 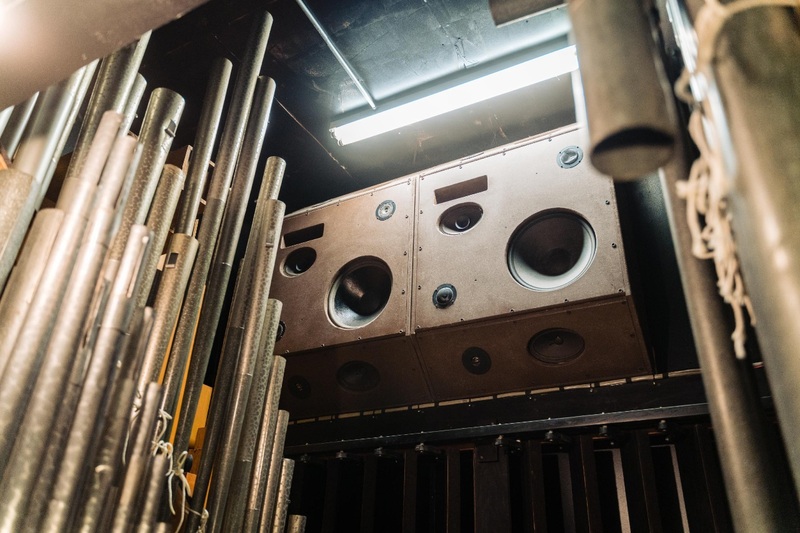 Beautifully voiced pipework can and does last for centuries, but digital technology becomes outdated quickly; the availability of replacement spare parts is also generally better with pipe organs than with all-electronic organs. Digital organs however, and "hybrid" pipe organs augmented with certain digital voices, are not going away; they have a distinct place and much to contribute. Hybrid digital and pipe organs (photo) have existed now for decades bridging the possibilities and realities of budgets and space; whenever possible the pipes in these instruments, as opposed to the digital voices, should remain the primary sound source with the digital stops functioning as secondary voices which complement the pipes. Personal preferences aside, if having the daring to push technology to the limits like this can bring the repertoire of the organ to new audiences that would otherwise ignore the organ, the "hybrid" pipe organ can only be judged a positive development.